It’s 8am and Cindy Vogels flicks through her Instagram feed when her finger lands on a photo of Lady Gaga donning a very familiar head piece – hers! The milliner’s life changed in that instant and she’s been on a whirlwind ever since, but it hasn’t been without a lot of hard work. Lady Gaga sits in the corner of Cindy Vogels’ studio, crooning through the speakers of her stereo, as if singing a lullaby to her as she works late into the night. Cindy’s four children are tucked into bed and fast asleep, it’s been a long day, but Cindy’s only just getting started – she has the upper echelon of Hollywood on her shoulders, waiting for a bespoke couture piece to wear to a special event in Beverly Hills. For Cindy, who was born, raised and schooled on the Sunshine Coast, some of her earliest creative memories were from her early teens, drafting and constructing in her mother’s garment manufacturing studio. “I had a strong desire early on to understand the cut and construction of everything fashion, hats included, and with rolls of fabric and machines threaded up in every colour, there was just creative freedom abound,” she says. “I made the finals of the then RAQ awards as a teenager one year with a sportswear collection, I had even hand made visors and caps to match the outfits. 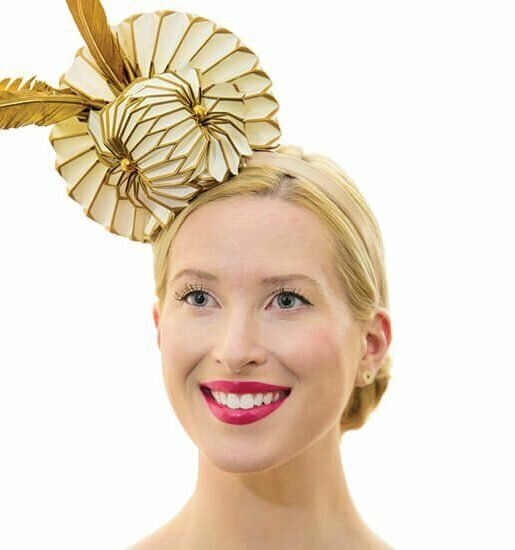 But it wasn’t until Melbourne Cup 2012 that Cindy took a serious interest in millinery as a sole focus when she designed and made three pieces for a luncheon event as an elaborate project-come-business-experiment. Cindy wound up taking out first, second and third prizes at the same event, cementing her decision to master a career in fashion. “I knew I was on track with my life that day, it was a powerful stepping stone to move forward and launch The Devoted Milliner in January 2013. Within 18 months, Cindy made her big break when she began working with Brandon Maxwell Studios, after one of their young designers saw a particularly flamboyant design Cindy had posted on Instagram, “in the wee hours one night”. But it did – and the photo of Lady Gaga wearing Cindy’s black feathered crown for a rendition of I Won’t Dance with Tony Bennett catapulted her career. That moment opened a flood gate of opportunities in America, the first was a lady in Santa Barbara who saw a new collection Cindy was showing in the afterglow of her Lady Gaga recognition. “She had never worn a hat before, but purchased a large orange ‘hatinator’ to wear to the Verve Polo Classic there, she was so well received at the event, images of her in my design were everywhere on all the Verve social media platforms,” says Cindy. As fate would have it, that lady was the national brand manager for Australian jewellery company Wearing Memories and introduced her to the Designer/Director and the pair have since formed a creative bond – just one of the many exciting collaborations Cindy has been involved in. “I’m part of showings at both London and New York fashion weeks with Wearing Memories utilising my designs to help showcase their jewellery on the international fashion stage. “And newly crowned Miss Australia, Deedee Zibara recently graced Day 2 of the Championships at Randwick wearing a Spanish-inspired fur felt hat and fashion by my clandestine clothing label Racy&Lucky.” In May, Cindy began a social media project with Lincraft Australia, writing articles to engage with their audience and test the waters for further engagement as a voice in their industry. “The original hat that sparked the Lady Gaga connection was made entirely of materials I’d purchased from Lincraft,” says Cindy. Last month Cindy lapped it up at Darwin Cup, having been selected to be part of Racing Fashion ‘The Movie’, a special feature film celebrating Australian racing fashion and millinery. She has also been kept busy fulfilling her ambassador roles to The Late Mail Luncheon in Brisbane and Melbourne, as well as her role as Arts and Cultural Ambassador for the Gympie region alongside celebrity chef Matt Golinski and X Factor star Caitlyn Shadbolt – whom Cindy also styled for her debut album cover shoot and video clip released last month. At the end of the day, when the champagne has lost its bubble and the perfectly-manicured race attire has been replaced with something a little more comfortable, a stripped-back Cindy is back at home, being a single mum to her four kids who are her whole world, “my dreams are big, my hands are full, but so is my heart – life is truly a beautiful chaos”. profile: How do you choose the right hat? 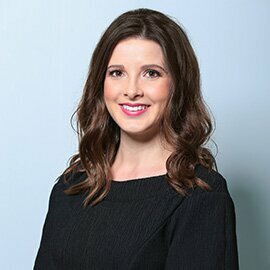 cindy: If you’re tall you can pretty much wear anything; try plenty on, fascinators with a smaller base and some fun height work well on short-to-average height women; do your research, Pinterest is where I send my newbie clients; find headwear that makes your heart beat faster, hats should be performance enhancing. profile: What is the best hairstyle when wearing a hat? cindy: Sleek is best, it’s all about the headpiece. profile: What are your styling tips for Race Day? cindy: Choose your shoes well, you need to be able to walk out at the end of the day looking as sassy and comfy as when you arrived, so pace yourself with alcohol also. Bobby pins are handy if the wind picks up and your headwear doesn’t play nice. profile: What’s in your clutch on Race Day? cindy: My Samsung Galaxy Note 4; business cards; favourite lip gloss; mini perfume; and if there is fabulous champagne being consumed I’m probably hoarding the little decorative metal caps to pop into my Wearing Memories jewellery.